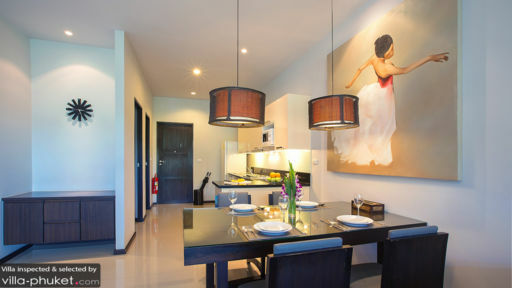 With a fusion of contemporary design and Thai hospitality, Villa Hinako is a two-bedroom holiday retreat on the magnificent island of Phuket. 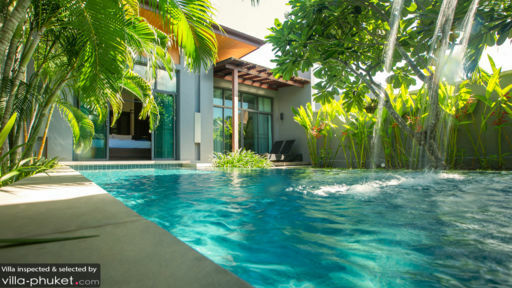 Situated at a short distance from Nai Harn beach, the villa offers its guests an exclusive and utterly rich experience of enjoying their own private space with the best services offered to make your stay extra special. Ample tropical greenery aside, the fresh breeze envelops the villa in an inviting and comfortable atmosphere, where you can rest and recuperate while on holiday! There are two bedrooms at Villa Hinako and one of them is the master suite while the other is the guest bedroom. Both rooms are furnished with king-sized beds and share a large bathroom fully furnished with a soaking tub and a shower area. The master suite opens out directly to the pool, so you can take a swim right after you wake up! Both rooms are air-conditioned and spacious enough to hold all your belongings without a hassle. The rooms are well-connected to the rest of the villa making it easier to move around. The tropical garden at Villa Hinako is quite large, giving you the chance to lie down on the freshly-cut grass and enjoy the bounty of nature. With tropical foliage all around you, you will be able to breathe in a lungful of clean air while you relax under clear blue skies! 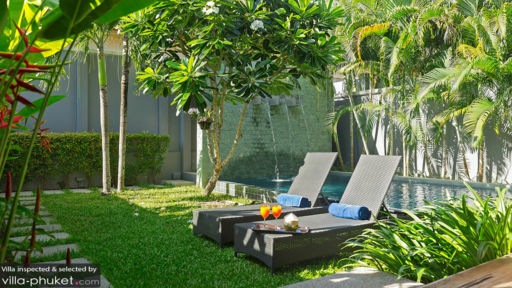 There is a lavish swimming pool that resides in the middle of this lush green garden. The pool is fed by a large water feature with three fountains, making for a tranquil and calming ambience around it. Under the shade of a constructed Sala, there lie a few sun loungers for you to relax and lounge on. The modern yet simple living area opens out to the pool and garden through glass sliding doors which brings in ample lighting inside! The room is furnished with comfortable couches pointing towards a flat-screen TV with surround system, perfect for movie nights! The room is decorated in a simplistic style with traditional artwork enhancing the cosy and comfortable vibe of the place. The living room shares space with the dining and kitchen area as well. Guests can find a dining table suitable for all the guests in the middle of the room and a fully-equipped kitchen in the back. The kitchen is fitted with the best amenities and is ready for use, if you wish to cook your meals instead of eating out or request the staff to make some delicious local delights! There is a laundry room right next to the living room, also for your use. The friendly staff at the villa provides exceptional service to the guests to ensure a memorable stay. All your needs will be met without a hassle and it will definitely be the stay of a lifetime! All the facilities you could possibly need can be found in the vicinity of Villa Hinako including supermarkets, family mart, gas stations etc. The beaches, Nai harn and Rawai, are all at a short distance and they are the best way to spend your days next to the sea! There are multiple restaurants offering international cuisines that you can visit if you wish to outside and try out some new dishes! The villa was perfect for our stay. It was well equipped and the pool was excellent. The location was great as 4 beaches were within 10 minutes drive. The area has many good restaurants and bars. I will certainly stay here on any future trips to Phuket.